Line 8x4-inch loaf pan with foil, leaving edges of foil hanging over sides of pan. Divide condensed milk evenly between 2 medium bowls. Stir Key lime pie yogurt into 1 bowl. Stir strawberry yogurt into remaining bowl. Spread Key lime pie mixture into foil-lined loaf pan. Sprinkle with cereal. Gently spoon and spread strawberry mixture on top. Freeze at least 8 hours until firm. To serve, use foil to lift frozen loaf from pan. Pull back foil and remove. Let stand 5 to 10 minutes to soften slightly. Cut into eight 1-inch slices. Serve immediately. 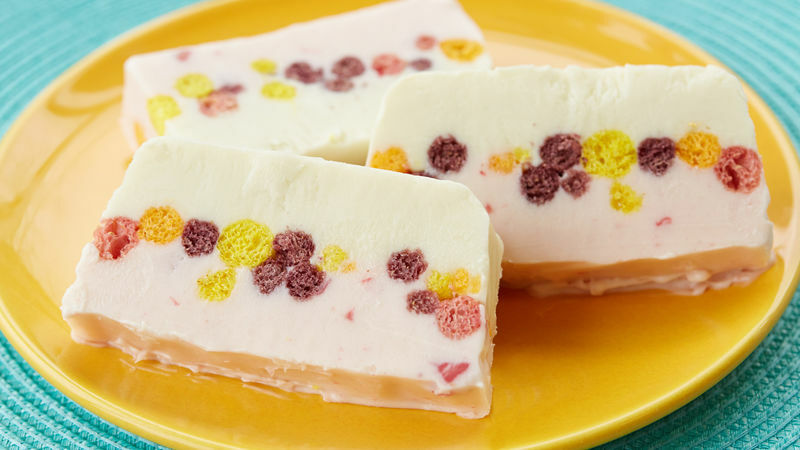 Here's a colorful new take on an ice cream bar--fruity Trix® cereal sandwiched between layers of homemade frozen yogurt. Be sure to let the frozen yogurt cake stand at room temperature for several minutes for easier slicing. Use a heavy-duty chef knife.